In some design optimization problems, it is required to optimize a multi-modal objective function with a variable number of design variables. Most standard optimization algorithms are not suitable for this type of problem. The Hidden Genes Genetic Algorithms (HGGA) is a biologically inspired concept, developed to handle global optimization problems where the number of design variables is solution dependent. 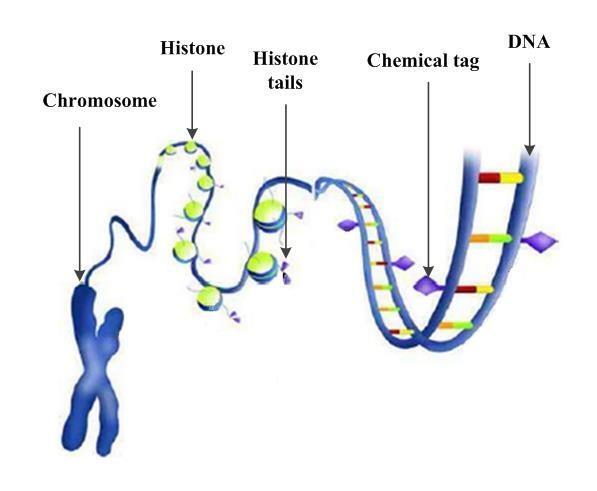 A widely used illustration that shows chemical tags (purple diamonds) and the “tails” of histone proteins (purple triangles) marking DNA to determine which genes will be transcribed. breathing genes are shut off in the eyes. This duty scheduling is done in another layer of coding in histone which tells genes in a cell what coding they should read and what they should shut off*. This information in the histone about the status of the genes are inheritable to the next generations** and the genes that are shut off are called hidden genes. In the proposed HGGA, a fixed chromosome length is assumed for all solutions in the population. Each chromosome is divided into effective and ineffective segments. The effective segment in a chromosome includes the design variables for that solution. The ineffective segment includes only hidden genes. Hidden genes are excluded in objective function evaluations. Full chromosomes undergo standard genetic operations. Tags are appended to chromosomes to identify which genes are hidden. These binary tags evolve over subsequent generations based on logical or stochastic operations. O. Abdelkhalik, Hidden Genes Genetic Optimization for Variable-Size Design Space Problems. Journal of Optimization Theory and Applications, Springer, Volume 156, Number 2, 2013. Shadi Darani and Ossama Abdelkhalik, Developments on The Optimization of Interplanetary Trajectories using Hidden Genes Genetic Algorithms. AIAA/AAS Astrodynamics Specialist Conference, Long Beach, California, 13 – 16 September 2016. * Barry Starr. Spooled dna and hidden genes: The latest finding in how our DNA is organized and read. The Tech Museum of Innovation, Department of Genetics, Stanford School of Medicine, 201 South Market Street San Jose, CA 95113. http://www.thetech.org/genetics/news.php?id=31. ** Bryan M. Turner. Histone acetylation and an epigenetic code. Bioessays, 22:836–845., September 2000.